Back in July of last year Steven Frank released the first version of his Gems game for the iPhone. 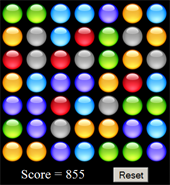 It was a pretty simple “match the colored gems” game, but each game was limited by 60 seconds. I modified it a bit to remove the time limitation and also changed it to use new images for each gem. You can play it for as long as you want now. Those first few weeks with the iPhone was a lot of fun. No documentation whatsoever for what you could do with MobileSafari, so it was fun figuring things out.